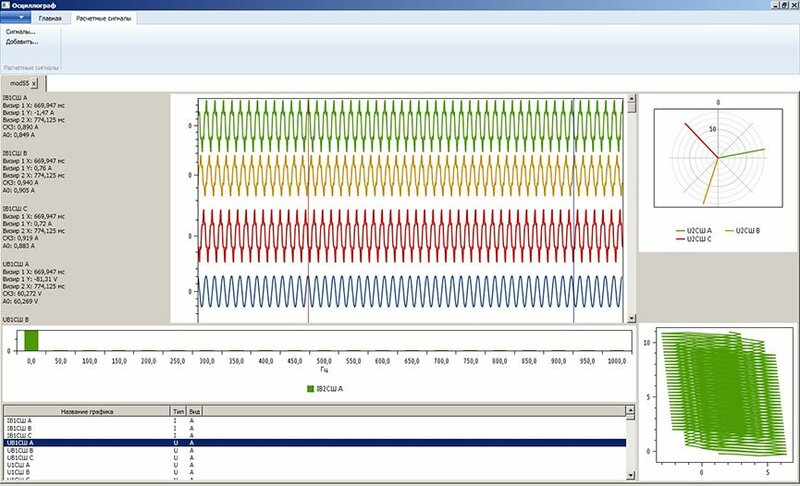 Development of an oscillograph application for quick view and analysis of protective relay and automatic controls data. The software is used in electric power engineering to analyse the readings of protective relay equipment. The main function of the application is the analysis of information related to protective relay system actuators with further diagnostics, detection of various protective relay operation modes and identification of the reasons for short circuiting. The application handles COMTRADE files and supports the plotting of signal oscillograph charts, vector diagrams, frequency plots and diagrams for signal estimates. The values of signals at specific points can be found using point markers on the oscillograph charts. In electrical power systems, various potential disruptions to normal power supply, whether affecting individual elements or groups of elements, are often brought about by a failure of the elements themselves. Protective relay and automation equipment provide a solution to the issue of protecting electrical power system equipment and electrical power stations from damage and accidents. The client&apos;s engineers carry out reconstruction works as well as construction of new power lines. Modern relay protection systems are built using microprocessor technology and have a high processing power and processing speed, thanks to which complex algorithms for equipment protection can be implemented in emergencies, shutting down sections of the electrical network with minimal time delays. The protective relay technology is used in high voltage electrical networks, and so implementing the technology is essential for all enterprises working with high voltage networks: generating companies, companies working with bulk power transmission lines, distribution facilities, and industrial enterprises. Integrating the protective relay with the automatic emergency response system allows for the full automation of network sections. We regularly carry out projects for engineering companies. Energy companies hold our name in high regard and are responsive to the fact that we work in the same field as them. Even for a company with a serious and highly competent staff of programmers, there is always room for additional tasks, such as the development of utilities. The programmers are not always able to cope with their given tasks, due to a lack of focused specialization in systems programming or simply a bottlenecking of in-house programmers working on key projects. Involving an outside team gives us a fresh perspective and allows us to come up with new solutions.